Water’s polarity is responsible for many of its properties including its attractiveness to other molecules. The difference in electronegativities between oxygen and hydrogen atoms creates partial negative and positive charges, respectively, on the atoms. Water molecules attract or are attracted to other polar molecules. Molecules that do not dissolve in water are known as hydrophobic (water fearing) molecules. polarity: The intermolecular forces between the slightly positively-charged end of one molecule to the negative end of another or the same molecule. One of water’s important properties is that it is composed of polar molecules. The two hydrogen atoms and one oxygen atom within water molecules (H2O) form polar covalent bonds. While there is no net charge to a water molecule, the polarity of water creates a slightly positive charge on hydrogen and a slightly negative charge on oxygen, contributing to water’s properties of attraction. Water’s charges are generated because oxygen is more electronegative, or electron loving, than hydrogen. Thus, it is more likely that a shared electron would be found near the oxygen nucleus than the hydrogen nucleus. Since water is a nonlinear, or bent, molecule, the difference in electronegativities between the oxygen and hydrogen atoms generates the partial negative charge near the oxygen and partial positive charges near both hydrogens. Nonpolar Molecules: Oil and water do not mix. 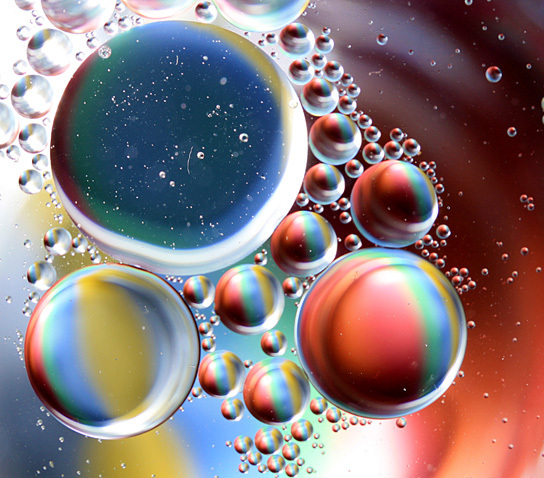 As this macro image of oil and water shows, oil does not dissolve in water but forms droplets instead. This is due to it being a nonpolar compound. As a result of water’s polarity, each water molecule attracts other water molecules because of the opposite charges between them, forming hydrogen bonds. Water also attracts, or is attracted to, other polar molecules and ions, including many biomolecules, such as sugars, nucleic acids, and some amino acids. A polar substance that interacts readily with or dissolves in water is referred to as hydrophilic (hydro- = “water”; -philic = “loving”). In contrast, nonpolar molecules, such as oils and fats, do not interact well with water, as shown in. These molecules separate from it rather than dissolve in it, as we see in salad dressings containing oil and vinegar (an acidic water solution). These nonpolar compounds are called hydrophobic (hydro- = “water”; -phobic = “fearing”). Hydrogen bonds: This interactive shows the interaction of the hydrogen bonds among water molecules. Water is able to absorb a high amount of heat before increasing in temperature, allowing humans to maintain body temperature. Water has the highest heat capacity of all liquids. Oceans cool slower than the land due to the high heat capacity of water. To change the temperature of 1 gram of water by 1 degree Celsius, it takes 1.00 calorie. The capability for a molecule to absorb heat energy is called heat capacity, which can be calculated by the equation shown in the figure. Water’s high heat capacity is a property caused by hydrogen bonding among water molecules. When heat is absorbed, hydrogen bonds are broken and water molecules can move freely. When the temperature of water decreases, the hydrogen bonds are formed and release a considerable amount of energy. Water has the highest specific heat capacity of any liquid. Specific heat is defined as the amount of heat one gram of a substance must absorb or lose to change its temperature by one degree Celsius. For water, this amount is one calorie, or 4.184 Joules. As a result, it takes water a long time to heat and a long time to cool. In fact, the specific heat capacity of water is about five times more than that of sand. This explains why the land cools faster than the sea. The resistance to sudden temperature changes makes water an excellent habitat, allowing organisms to survive without experiencing wide temperature fluctuation. Furthermore, because many organisms are mainly composed of water, the property of high heat capacity allows highly regulated internal body temperatures. For example, the temperature of your body does not drastically drop to the same temperature as the outside temperature while you are skiing or playing in the snow. Due to its high heat capacity, water is used by warm blooded animals to more evenly disperse heat in their bodies; it acts in a similar manner to a car’s cooling system, transporting heat from warm places to cool places, causing the body to maintain a more even temperature. Evaporation of water requires a substantial amount of energy due to the high heat of vaporization of water. The dissociation of liquid water molecules, which changes the substance to a gas, requires a lot of energy. The boiling point of water is the temperature in which there is enough energy to break the hydrogen bonds between water molecules. Water is converted from its liquid form to its gaseous form (steam) when the heat of vaporization is reached. Evaporation of sweat (mostly water) removes heat from the surface of skin, cooling the body. heat of vaporization: The energy required to transform a given quantity of a substance from a liquid into a gas at a given pressure (often atmospheric pressure). Water in its liquid form has an unusually high boiling point temperature, a value close to 100°C. As a result of the network of hydrogen bonding present between water molecules, a high input of energy is required to transform one gram of liquid water into water vapor, an energy requirement called the heat of vaporization. Water has a heat of vaporization value of 40.65 kJ/mol. A considerable amount of heat energy (586 calories) is required to accomplish this change in water. This process occurs on the surface of water. As liquid water heats up, hydrogen bonding makes it difficult to separate the water molecules from each other, which is required for it to enter its gaseous phase (steam). As a result, water acts as a heat sink, or heat reservoir, and requires much more heat to boil than does a liquid such as ethanol (grain alcohol), whose hydrogen bonding with other ethanol molecules is weaker than water’s hydrogen bonding. Eventually, as water reaches its boiling point of 100° Celsius (212° Fahrenheit), the heat is able to break the hydrogen bonds between the water molecules, and the kinetic energy (motion) between the water molecules allows them to escape from the liquid as a gas. Even when below its boiling point, water’s individual molecules acquire enough energy from each other such that some surface water molecules can escape and vaporize; this process is known as evaporation. Humidity, Evaporation, and Boiling: (a) Because of the distribution of speeds and kinetic energies, some water molecules can break away to the vapor phase even at temperatures below the ordinary boiling point. (b) If the container is sealed, evaporation will continue until there is enough vapor density for the condensation rate to equal the evaporation rate. This vapor density and the partial pressure it creates are the saturation values. They increase with temperature and are independent of the presence of other gases, such as air. They depend only on the vapor pressure of water. The fact that hydrogen bonds need to be broken for water to evaporate means that a substantial amount of energy is used in the process. As the water evaporates, energy is taken up by the process, cooling the environment where the evaporation is taking place. In many living organisms, including humans, the evaporation of sweat, which is 90 percent water, allows the organism to cool so that homeostasis of body temperature can be maintained. Water’s polarity makes it an excellent solvent for other polar molecules and ions. dissociation: The process by which a compound or complex body breaks up into simpler constituents such as atoms or ions, usually reversibly. hydration shell: The term given to a solvation shell (a structure composed of a chemical that acts as a solvent and surrounds a solute species) with a water solvent; also referred to as a hydration sphere. Dissociation of NaCl in water: When table salt (NaCl) is mixed in water, spheres of hydration form around the ions. Cohesion allows substances to withstand rupture when placed under stress while adhesion is the attraction between water and other molecules. Describe the cohesive and adhesive properties of water. Cohesion holds hydrogen bonds together to create surface tension on water. Since water is attracted to other molecules, adhesive forces pull the water toward other molecules. Water is transported in plants through both cohesive and adhesive forces; these forces pull water and the dissolved minerals from the roots to the leaves and other parts of the plant. Have you ever filled a glass of water to the very top and then slowly added a few more drops? Before it overflows, the water forms a dome-like shape above the rim of the glass. This water can stay above the glass because of the property of cohesion. In cohesion, water molecules are attracted to each other (because of hydrogen bonding), keeping the molecules together at the liquid-gas (water-air) interface, although there is no more room in the glass. Cohesion allows for the development of surface tension, the capacity of a substance to withstand being ruptured when placed under tension or stress. This is also why water forms droplets when placed on a dry surface rather than being flattened out by gravity. When a small scrap of paper is placed onto the droplet of water, the paper floats on top of the water droplet even though paper is denser (the mass per unit volume) than the water. Cohesion and surface tension keep the hydrogen bonds of water molecules intact and support the item floating on the top. 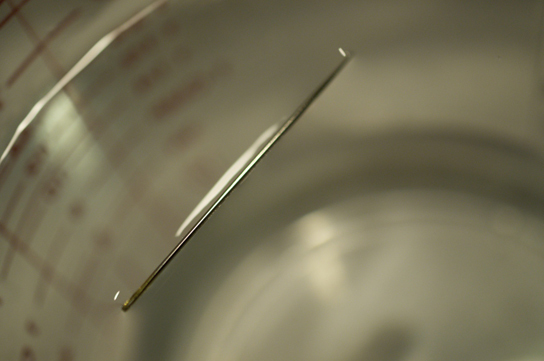 It’s even possible to “float” a needle on top of a glass of water if it is placed gently without breaking the surface tension. Surface Tension: The weight of the needle is pulling the surface downward; at the same time, the surface tension is pulling it up, suspending it on the surface of the water and keeping it from sinking. Notice the indentation in the water around the needle. These cohesive forces are related to water’s property of adhesion, or the attraction between water molecules and other molecules. This attraction is sometimes stronger than water’s cohesive forces, especially when the water is exposed to charged surfaces such as those found on the inside of thin glass tubes known as capillary tubes. Adhesion is observed when water “climbs” up the tube placed in a glass of water: notice that the water appears to be higher on the sides of the tube than in the middle. This is because the water molecules are attracted to the charged glass walls of the capillary more than they are to each other and therefore adhere to it. This type of adhesion is called capillary action. 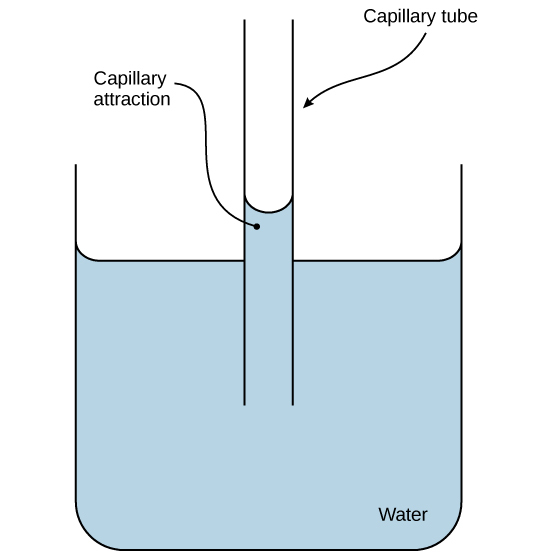 Adhesion: Capillary action in a glass tube is caused by the adhesive forces exerted by the internal surface of the glass exceeding the cohesive forces between the water molecules themselves. Why are cohesive and adhesive forces important for life? Cohesive and adhesive forces are important for the transport of water from the roots to the leaves in plants. 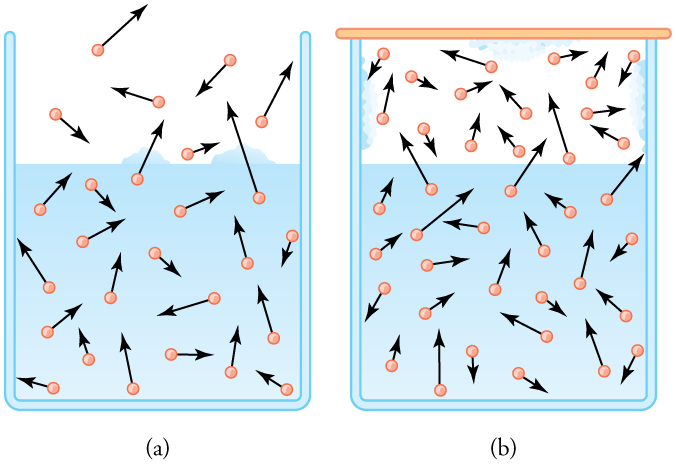 These forces create a “pull” on the water column. This pull results from the tendency of water molecules being evaporated on the surface of the plant to stay connected to water molecules below them, and so they are pulled along. Plants use this natural phenomenon to help transport water from their roots to their leaves. Without these properties of water, plants would be unable to receive the water and the dissolved minerals they require. In another example, insects such as the water strider use the surface tension of water to stay afloat on the surface layer of water and even mate there. 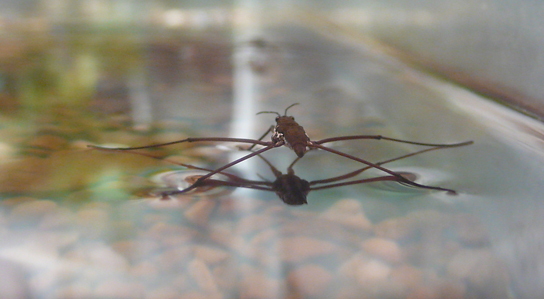 Cohesion & Adhesion: Water’s cohesive and adhesive properties allow this water strider (Gerris sp.) to stay afloat. Acids dissociate into H+ and lower pH, while bases dissociate into OH– and raise pH; buffers can absorb these excess ions to maintain pH. Buffers are solutions that contain a weak acid and its a conjugate base; as such, they can absorb excess H+ ions or OH– ions, thereby maintaining an overall steady pH in the solution. pH is equal to the negative logarithm of the concentration of H+ ions in solution: pH = – log[H+]. The negative log of 1 × 10-7 is equal to 7.0, which is also known as neutral pH. 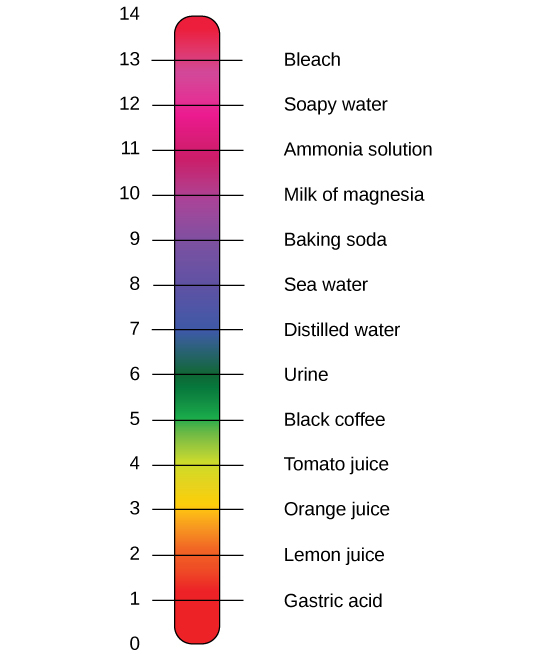 Human cells and blood each maintain near-neutral pH. The stronger the acid, the more readily it donates H+. For example, hydrochloric acid (HCl) is highly acidic and completely dissociates into hydrogen and chloride ions, whereas the acids in tomato juice or vinegar do not completely dissociate and are considered weak acids; conversely, strong bases readily donate OH– and/or react with hydrogen ions. Sodium hydroxide (NaOH) and many household cleaners are highly basic and give up OH– rapidly when placed in water; the OH– ions react with H+ in solution, creating new water molecules and lowering the amount of free H+ in the system, thereby raising the overall pH. An example of a weak basic solution is seawater, which has a pH near 8.0, close enough to neutral that well-adapted marine organisms thrive in this alkaline environment.